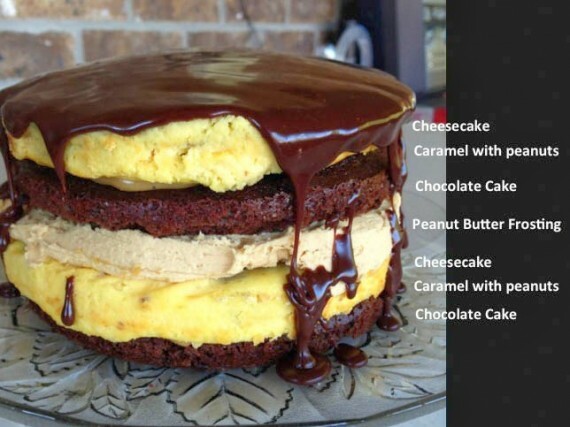 This cake would definitely fall into the “special occasion” category. Mainly because making it is an all-day affair. Granted, part of that time is inactive time (i.e. cooling), but it would probably be better to divide the steps up over two days. 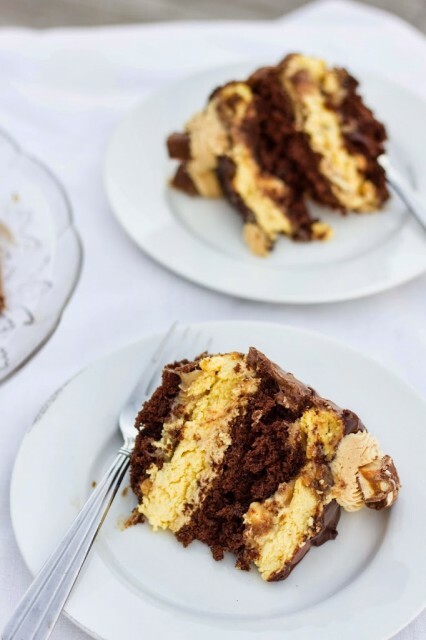 You could make the cake and cheesecake one day, chill those layers overnight, and then assemble and make the frosting and ganache the second day. I made this cake while I was on vacation a few weeks back, so I wasn’t pressed for time. In fact, I deliberately chose a dessert with multiple steps because I wanted an all-day baking fest ;). 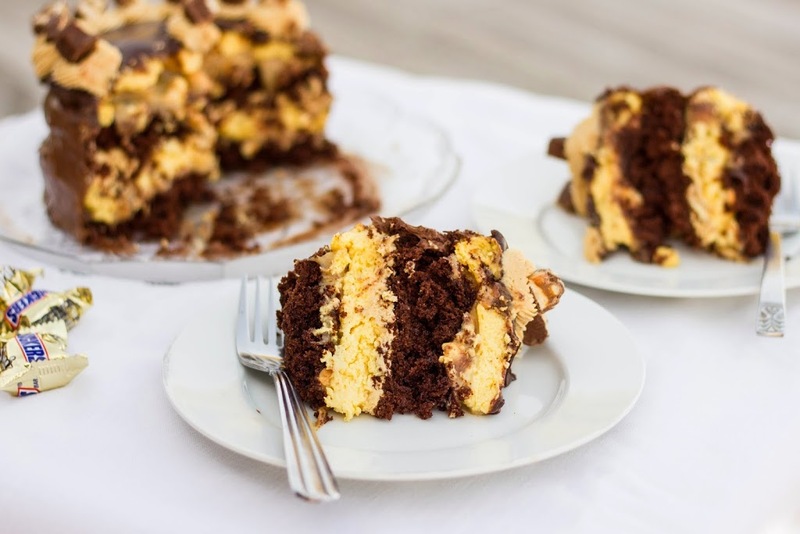 This cake is reminiscent of something you’d get at The Cheesecake Factory. 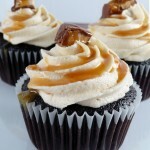 It has chocolate cake, snickers cheesecake, caramel, peanut butter frosting, and chocolate ganache. You see why it’s a labor of love?? Be ready to wash dishes – or better yet, just go to your parents’ house and let your mom wash dishes for you. Not that I’d ever do that… Oh wait, that’s exactly what I did! 😉 It’s totally worth the effort though! It’s delicious! If you are more patient that I am, you should wait until the cake is completely chilled (or partially frozen) before slicing so you get prettier pieces. Enjoy! READ ALL INSTRUCTIONS BEFORE STARTING! Nothing about this cake is hard, but there are multiple steps. Even though the layers are small (6 inch), this cake will still serve at least 8. However, if you want a larger cake you could easily double the recipe and use 8 or 9 inch pans – adjusting the baking times slightly. 1. Preheat oven to 350 degrees F. Grease two 6-inch round pans and line with parchment paper. 2. Combine dry ingredients in large bowl. Add eggs, milk, oil, and vanilla. Beat by hand or use a mixer until fully blended, about two minutes. Stir in boiling water. Note that the batter will be thin. 3. Pour the batter equally into the pans and bake for 10 to 15 minutes or until a toothpick inserted into the center comes out clean. Place the pan on a cooling rack for ten minutes. Remove from the pans and allow the cake to cool completely on a cooling rack. 1. Preheat oven to 325 degrees. Line two 6-inch round pans with parchment paper. 2. In bowl of stand mixer with paddle attachment, beat cream cheese and sugar until light and fluffy – about a minute. Add egg, sour cream, and vanilla and beat until combined. Stir in chopped snickers. Divide batter evenly among prepared pans. Bake in preheated oven for 20-25 minutes or until center is just set. Cool completely. 1. Combine caramels, sweetened condensed milk, and butter in microwave safe bowl and microwave in 30 second intervals until melted and smooth. 2. Divide evenly over cooled cheesecake layer and top with chopped peanuts. 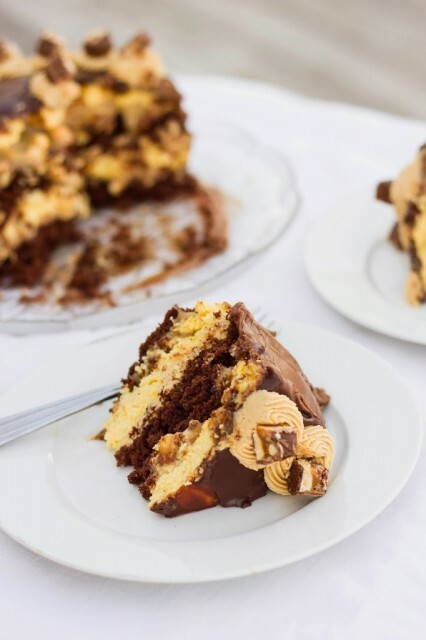 Refrigerate for several hours or until caramel is firm. 1. In bowl of stand mixer with paddle attachment, beat butter and peanut butter until light and fluffy. 2. Gradually add powdered sugar until fully combined. Beat another minute. Add cream until frosting is light and fluffy. 1. Combine all ingredients in double boiler, stirring constantly until melted. Cool slightly. pour 1/2 over cake. 2. Beat remaining ganache until thick and light in color. 1. Place cake layer on serving plate. 2. Top with cheesecake layer, caramel side down. 3. Spread about half the peanut butter frosting over cheesecake layer. 4. Place remaining chocolate cake layer on peanut butter frosting. 5. Place remaining cheesecake layer, caramel side down on cake layer. 6. Top with half ganache. 7. Spread remaining ganache onto sides of cake. 8. Pipe remaining peanut butter frosting on top of cake with star tip. 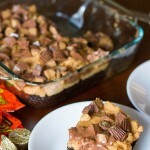 Garnish with more chopped snickers if desired. Refrigerate several hours or overnight before serving. For neater slices, freeze before cutting.